Since the arrival of the very first iPhone, Apple users have been hooked. These days there are nine major iPhone models and a dozen variations. Although the first instinct for the Apple fanatic may be to immediately get the newest version, that may not always be your best option. By doing an iPhone model comparison, you will be better able to determine if it may be time for an upgrade. Our iPhone model comparison begins with the iPhone 4, which is still popular with users even though it’s no longer sold by Apple. The iPhone 4 runs on the older A4 chipset, and so it handles the latest apps slower than newer models. Another important note: Apple announced in 2016 that it would no longer support updates to the iPhone 4, so that’s something to consider in an iPhone model comparison. But if you only use your iPhone for its basic features, and don’t mind a slower phone, the iPhone 4 may be a good option. The iPhone 5 still continues to be compatible with Apple’s latest iOS, the iOS 12. This means the phone continues to receive updates with all the latest features that Apple has developed. The iPhone 5 also has a number of features that make it a little more powerful than the iPhone 4, including a better low light camera and a larger screen. In an iPhone model comparison, this could be a better option than the iPhone 4 if you want more features. Of the first three models in our iPhone model comparison, it should be no surprise that the iPhone 6 boasts the strongest features. The iPhone 6 shifted to a larger display than even the iPhone 5 and a higher quality Retina HD display, allowing for larger images at a higher quality. It is also slimmer than previous models, which will be important for some in an iPhone model comparison. It continues to upgrade, so it runs faster than previous models and includes an improved camera including new recording features. This made the iPhone 6 the most powerful of the earlier models in our iPhone model comparison. One of the most controversial changes Apple has made recently was the switch the back side of newer models. In the iPhone 7, the back is made of its traditional aluminum. Next up: all models, will have glass-back housing. Why the change? Apple wanted to add wireless charging, which was only possible with glass hardware. So in an iPhone model comparison, you’ll need to consider whether or not wireless charging is important to you. 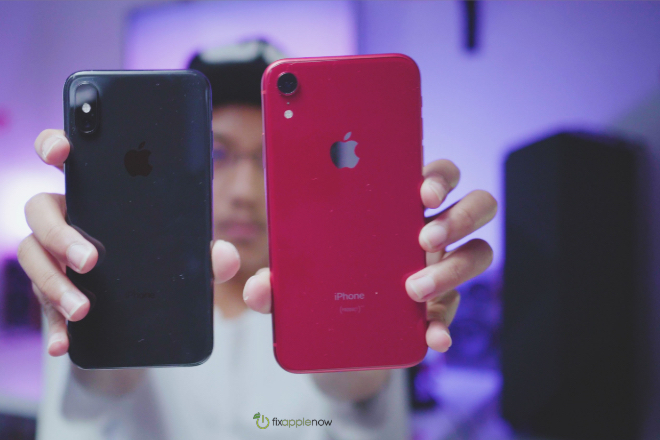 When doing an iPhone model comparison, the iPhone 8 does have some clear advantages. There’s its True Tone display, which allows the phone to more clearly display images in a variety of lighting conditions automatically. It’s also faster since it uses the A11 chipset, plus it includes new features in its camera that allow for faster processing, better low light photos, and photos with greater noise reduction. The iPhone 8 is slightly heavier and larger, but it can also be wirelessly charged. In an iPhone model comparison, there are some trade-offs with the iPhone 8, but it does have its perks. The iPhone X stood apart in almost every way from the previous phones in this iPhone model comparison when it was released in 2017. It gets rid of the home button and Touch ID button in favor of using Face ID to scan a user’s face and grant access to the phone. The iPhone X also includes dual rear cameras that integrate a telephoto camera for high-quality optical zoom, making for the clearest photos yet. It also includes a larger screen than any of the older iPhone models. The iPhone X sold well, so some consumers were surprised when the model was discontinued in 2018. Of course refurbished phones can still be purchased online and in some stores, so it’s still worth considering the iPhone X as an affordable option in iPhone model comparisons. In 2018, Apple released two new iPhone models at the same time: the iPhone XS and the iPhone XR. As the latest models to date, they both include updated hardware. (Specifically, the A12 bionic chip, as opposed to the iPhone X’s A11.) However, an iPhone model comparison reveals some significant differences between the XS and the XR, including the price tag. The iPhone XS is both the smaller and the more expensive of these two models. (Although if you prefer a larger phone with all the newest features, the iPhone XS Max has a 6.5” display, making it even larger than the XR, which has a 6.1” display.) But the iPhone XS has its advantages, including a more vibrant OLED display, dual cameras, and 10X digital zoom. In an iPhone model comparison, these may be worth the extra cost, especially if photography is particularly important to you. What Model is Right For You? At the conclusion of this iPhone model comparison, there were some significant discoveries. iPhone X has the most powerful and modern features. However, earlier models are more affordable and have features like the home button and a smaller display. They also offer a simpler operating system that many Apple users don’t want to sacrifice. In many cases, it may make more sense for users to repair the earlier models they already have, or purchase a used and refurbished model. Which iPhone is best for you depends entirely on your own preference. If you are still unsure of what model fits you best, it always helps to go to a reliable Apple technician, talk through your needs, and use a hands-on iPhone model comparison to see what makes the most sense for your lifestyle. Fix Apple Now has certified Apple technicians to repair, update and upgrade Apple products for businesses and personal use, and sells new Apple accessories and refurbished inventory. Visit Fix Apple Now Hallandale or Weston shops, or send us your Apple for repair via mail.